Thanks for your interest in the Scout Music Design Lab. Create a classic and timeless song that will never get old. A classic jukebox song with male or female vocals. Like a lost song from the late 50s / early 60s. Melody: Insanely singable. Memorable. Easy. Instrumentation: Light. Real sounds. Very light drums. Snaps etc instead of drum kit? Bring in your uncle to play guitar? Vocals: Simple. Harmonies. Group vocals? Whistles? Production/Vibe: Groove. No click tracks. Imperfect. Not overproduced. 1 Send email to submissions@scoutmusic.tv with Full Name and Phone #. 2 I’ll invite you to a box.com folder where you can upload demos, lyrics, etc. 3 By submitting music to the folder, you agree to the Splits / Track Ownership below. 1 (Composition) All writers will divide the 100% writer share of the song(s). Each writer’s share will be based on their contribution to the finished composition(s) as determined by Scout. Scout will control 100% of the publishingto account for the direction, strategy, coordination and improvement of the composition(s), as well as the licensing, registration and collection. 2 (Master) Performers will divide 50% ownership of the master recording(s), based on their contribution to the finished recording(s) as determined by Scout. Scout will control 50% of the master recording(s) to account for the direction, strategy, coordination, improvement, mixing and mastering of the master(s), as well as the licensing and collection. 3 Each writer and performer will be given a full split sheet with all parties’ ownership. 4 Scout will have the exclusive right to promote, license and negotiate deals on behalf of the composition(s) and song(s), to bring exposure to our work on the song(s) and to help us all earn money based on our joint efforts. 5 This deal does not apply to music you produce outside of this challenge, and you are free to enter into other deals on any other compositions and songs you write or perform. The Scout Music Design Lab is part of Scout Music, an Oakland music production and publishing company started in 2005. 1 to assist up-and-coming musicians to learn techniques and strategies to create music on a world-class level. 2 to create truly outstanding and in-demand music styles for tv, movie, advertising placement and label opportunities that will generate significant revenue for all involved. 3 to give in-depth mentorship and exposure to participants in MDL. 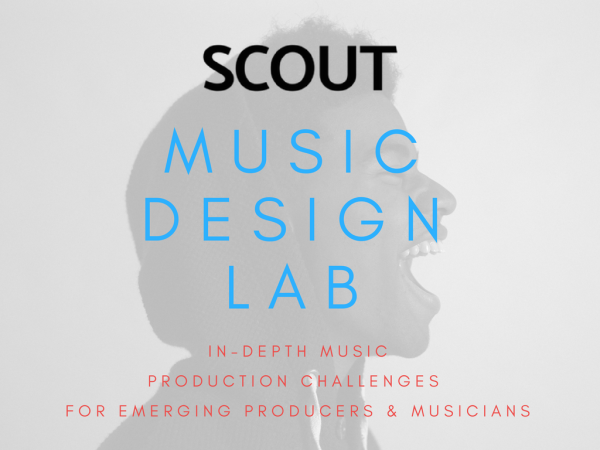 More info on the Scout Music Design Lab.